Today it marks the 21st of December, 2012 – apparently judgment day, the date Mayans predicted to be the end of the world. An eternal scare story that leaves only one thing for certain, it won’t be the last apocalyptic prophecy. Personally speaking, the 21st of December has always been my lucky day, it was my beloved grandmother’s birthday, it is the day my husband and I came together (which might have been already his personal Armageddon, haha). 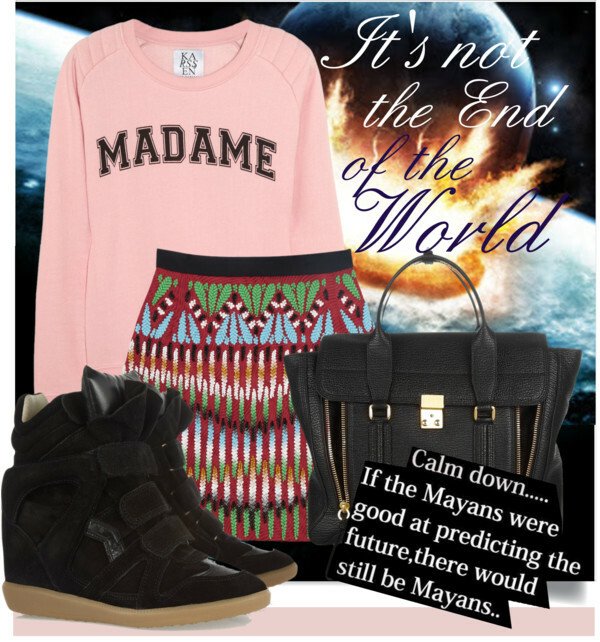 Nevertheless, if the world goes down today, I will definitely go shopping before and get this outfit: Madame cotton-blend terry sweatshirt by Zoe Karssen, Natalie embroidered twill and satin mini skirt by Peter Pilotto, Bekket leather and suede sneakers by Isabel Marant and Pashli shark-embossed leather trapeze tote by 3.1 Phillip Lim.